LONDON--(BUSINESS WIRE)--According to the latest market study released by Technavio, the global orthopedic bracing and support systems market is expected to reach USD 4.330 billion by 2021, growing at a CAGR of more than 4%. This research report titled ‘Global Orthopedic Bracing and Support Systems Market 2017-2021’ provides an in-depth analysis of the market in terms of revenue and emerging market trends. This market research report also includes up to date analysis and forecasts for various market segments and all geographical regions. The global orthopedic bracing and support systems market is growing at a steady pace, and most of the growth is originating from emerging markets in Asia-Pacific (APAC), South and Central America, and MEA. However, the market’s growth is slightly inhibited due to the high cost of orthopedic bracing and support systems. As a result, the market will see an elevated number of consolidation between small and large vendors; smaller vendors are more focused on innovation while larger vendors are venturing into new development areas and acquiring smaller companies. In developed countries like the UK and the US, the governments are encouraging research institutes and small companies by providing funding for development of novel products. Products that hold the potential to increase cost effectiveness, ease lives of patients, and provide better orthopedic stability are currently being focused on by the governments. The funding can lead to the development of new advanced technology, which can act as a driving factor in the market. Lower extremity bracing and support systems are used to support the hip, knee, and ankles. The advanced technology provided by governments will increase the adoption of lower extremity bracings in the market. The KEA technology is one of the advanced technologies in the market, which allows free joint movement and smoothens the extension movement by allowing it to perform sit-to-stand and stand-to-sit. The efficacy of this technology has been clinically proven, which will increase its adoption during the forecast period. Fractures in the spine can be treated by using spinal braces as these braces are rigid in nature, limiting the motion of the spine. This brace is commonly used after spinal fusion surgeries. Researchers are focusing on developing spinal braces that modulate the corrective forces on the spine for the patients suffering from scoliosis. At the time of physical rehabilitation, bracing and support systems are used so that it can improve scoliosis during bone growth. “A combined study conducted by the Orthopaedic Rehabilitation Services, Germany, and Scoliosis 3DC, US, found that around 90% of the scoliosis cases are adolescent idiopathic scoliosis, and the remaining are due to congenital, neuromuscular, and mesenchymal disorders,” says Barath. Become a Technavio Insights member and access all three of these reports for a fraction of their original cost. As a Technavio Insights member, you will have immediate access to new reports as they’re published in addition to all 6,000+ existing reports covering segments like in-vitro diagnostics, cardiovascular devices, and life science research tools. This subscription nets you thousands in savings, while staying connected to Technavio’s constant transforming research library, helping you make informed business decisions more efficiently. 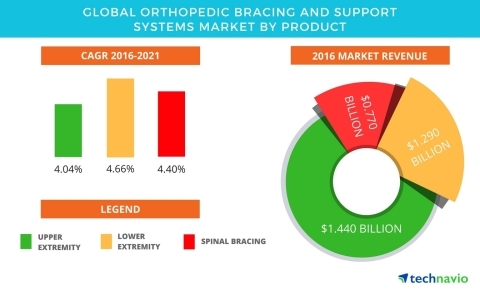 According to the latest market study released by Technavio, the global orthopedic bracing and support systems market is expected to reach USD 4.330 billion by 2021, growing at a CAGR of more than 4%.